So Lymington should be more than satisfied to have about eight to which, perhaps, we should add the two at Everton Grange. I feel I should clear up a technical point regarding these walls being described as being ‘half a brick’ thick. By the opening of the eighteenth century the traditional English brick size is very proportional measuring 9 inches long, 4½ inches wide and three inches deep so a brick thick would equate to the long side while the short side (4½ inches) would be half a brick. So walls built with bricks laid lengthways are half a brick thick. Now I am going to suggest a bit of homework: from the copious junk mail you undoubtedly receive regularly take an unwanted sheet of A4 paper, fold it half longwise, and cut along the fold, then fold either piece (or if your excited by the idea, why not both?) in half and then half again so you have a zigzag or crinkle. This you can place upright on the table and you will see that it is stable. Even if you gently blow it (you might not want any other adults to see you doing this!) you will find it may skid along the table but it will not easily fall over. This simple experiment immediately shows how the crinkles or zigzags impart stability; a principle that applies to the real life walls which require no buttresses or other supports. In 1991 the Lymington Society published ‘Occasional Paper, No. 2’ on this subject written by J.C. Taylor. 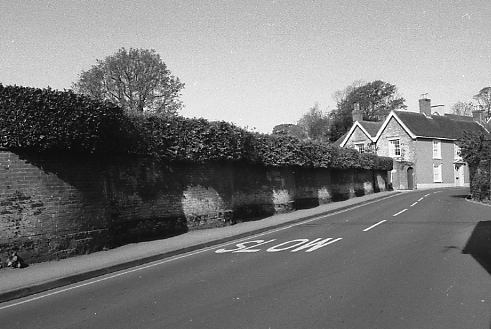 In this he states, that the wall in Church Lane, a boundary between the lane and the garden of Elm Grove House, “was built in 1798 by the commander of the garrison troops based in Lymington to defend it from the French.” My extensive and detailed search through the literature and records of that time reveals nothing to substantiate this though the threat of invasion was real enough. It is not easy to imagine what defensive advantages a crinkle-crankle wall would bestow as opposed to a straight wall. Later he remarks that one of the first tasks of the Hanoverian commander, “was to build a wall to screen their activities from the disapproving eyes of the townsfolk and so the wavy wall, a type of construction common in northern Germany, came to Lymington.” This raises the further question as to why a wavy wall would make a better screen than a straight wall. And why are the eyes of the townsfolk disapproving—what were those soldiers up to? He does describe the very fine wavy wall in the garden of Everton Grange: interestingly, Marion Cran in her book, ‘I know a Garden’ published by Herbert Jenkins in 1933; writes of the occasion when she visited the then owners, Col. William and Mrs Kemmis at Everton, she asked, “What made you come here?” to which she received the response, “The ‘bendy’ walls and that big oak.” It is informative to read the author’s further observations, “The kitchen gardens and greenhouses are behind huge walls (meaning hedges) of ancient yews, topped with peacocks and further more enriched within by the quaint bendy walls which are supposed to have been built by French prisoners in the Napoleonic Wars (there are walls like it in one place in Virginia, America). They are of narrow bricks one brick thick (sic), in long wavy line of continuous, semi-circular bays.” (page 138). 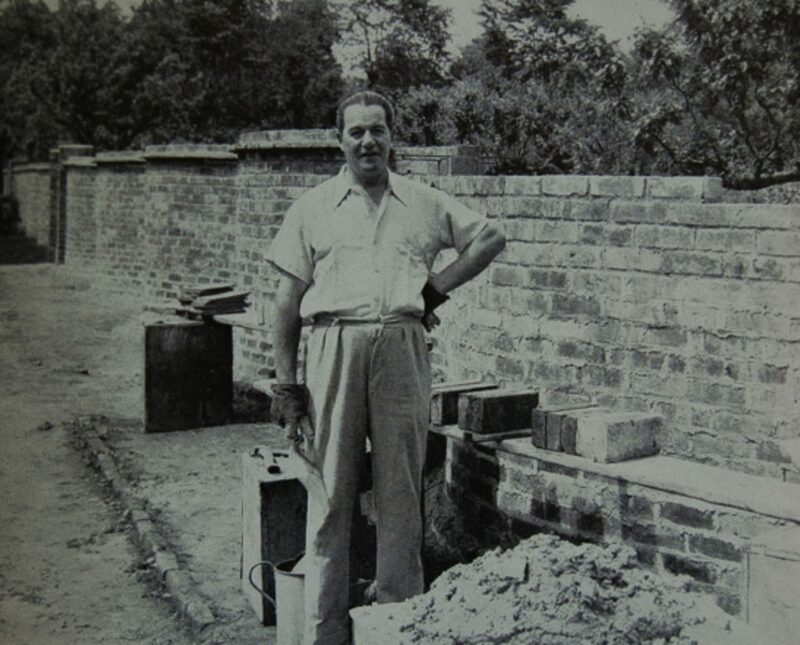 The renowned novelist, Dennis Wheatley, was an amateur but skilful bricklayer and, after purchasing Grove House (Grove Place when he bought it in 1945), began to practise and refine his skills. He left a record of his achievements in a semi-autobiographical work called, ‘Saturdays with Bricks’ published in 1961. Unfortunately, the author gives no source of reference for these statements, so they have no independent historical authority but, nevertheless, require quoting (even if dubious) as a possible explanation. The crinkle-crankle wall just below and opposite that of Elm Grove House was built by Dennis Wheatley and remains as a very tangible record of his bricklaying skills. We have to turn to Charles Vancouver, whose book General View of the Agriculture in Hampshire was published in 1813, to provide a contemporary account which, possibly, may refer to the Elm Grove House garden wall. I think it probably does. These walls are such a distinctive architectural feature in Lymington that it seemed worth drawing them to the attention of readers of the ‘A&T’ and showing how they have exercised the minds of earlier commentators. I am sure many will feel, as I do, that they are curiosities with architectural and artistic merit. I have drawn attention to various descriptions of these walls not to find fault with those supplying the descriptions but to indicate the lack of reliable historical evidence, some of which is quite contradictory. I hope, therefore, that my observations, research and conclusions provide a clearer understanding and appreciation of the subject. This article was written by the President of the LDHS Jude James. We are grateful to him for allowing us to use publish it on our website. It should be noted that this was first published in the New Milton Advertiser and Lymington Times on 28th May 2016.